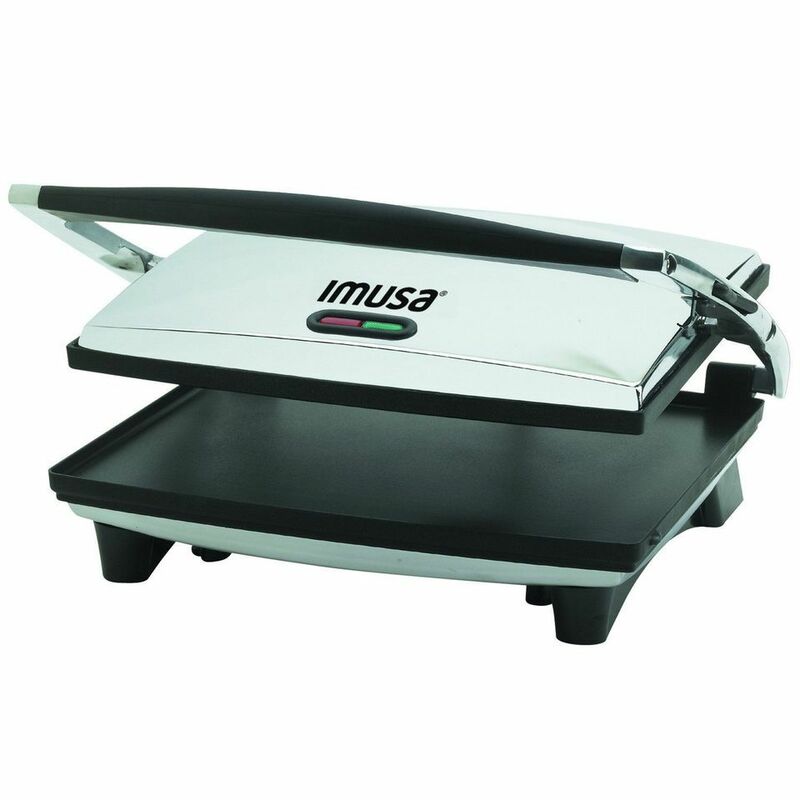 This press has a stainless steel exterior finish and a nonstick cooking surface. While you can’t adjust the cooking temperature, it is set at the perfect degree for toasting sandwiches without burning them. Lights indicate that the press is on and when the press is ready for cooking. The flat surfaces of this appliance are ideal for pressing sandwiches while toasting the surfaces evenly. The large 12-inch by 10-inch surface can accommodate at least two normal sized sandwiches, and the floating hinge adjusts for cooking foods of various thicknesses, from quesadillas to fat sandwiches. Since the surface is completely flat and there’s ledge to contain juices and no drip tray to collect cooking fats, this isn’t useful for cooking meats or other foods that might drip. This deep-pocket sandwich press is different from presses with flat or ridged surfaces since it has wells that the sandwiches fit into. You can cook one or two sandwiches at a time. The raised edges around the perimeter seal the ingredients inside the sandwich while a diagonal ridge creates an indent across the sandwiches to divide them for easy slicing. This press doesn’t have adjustable temperatures and has two indicator lights that show when power is on and when it’s ready to cook. While you can also use this for cooking French toast or omelets, you wouldn’t use this grilling steaks or chicken. If you build a sandwich that’s too fat, it might not fit in this press, and you’re limited to using traditional sandwich bread from the grocery store. Homemade bread or other shapes might not fit in the wells. If sandwiches are your passion or you cook for crowds, this is a commercial sandwich press that will fit in your kitchen. Since it’s sold for professional kitchens, the price is high, but it’s built to last and to make a lot of sandwiches over its lifetime. The press has a brushed stainless steel exterior, a removable drip tray for easy cleaning, and heat resistant handles. The plates are made from ribbed cast iron for fast, even cooking. It has a light that indicates power and another that indicates it’s ready to cook. The hinged lid automatically balances and adjusts for food up to three inches thick. Besides sandwiches, you can use this for burgers, chicken, steaks, and more since the temperatures is adjustable up to 570 degrees Fahrenheit. Since the plates aren’t removable, it’s not as easy to clean as other models. It can run on a home 15-amp circuit, but you shouldn’t plug it into an outlet where another appliance is also drawing power. If you hate single-use appliances, you’ll appreciate this model from George Foreman. This press does much more than just toast sandwiches, since it includes a variety of plates and there are more available for purchase. The included ceramic grill plates are intended for grilling or making paninis, the baking pan can be used as a griddle or a sauté pan in addition to baking, and the muffin tin insert can be used for making muffins or mini quiches. Waffle plates and a 3-well omelet/snack plate are included with some versions of this press, and all the plates are dishwasher safe. You can adjust this press to cook at an angle to drain fat, or let it sit flat for cooking muffins or waffles. There are digital controls that adjust the temperature from 325 to 450 degrees Fahrenheit with a special button for a 500-degree burst for searing. It has a floating hinge for foods of various thicknesses, and a large cooking surface. While most sandwich makers feature traditional nonstick coatings, this one has ridged plates with a ceramic coating that’s less likely to bubble, flake, or peel off. It’s also nonstick and easy to clean. Plus, it cooks faster than similar models. 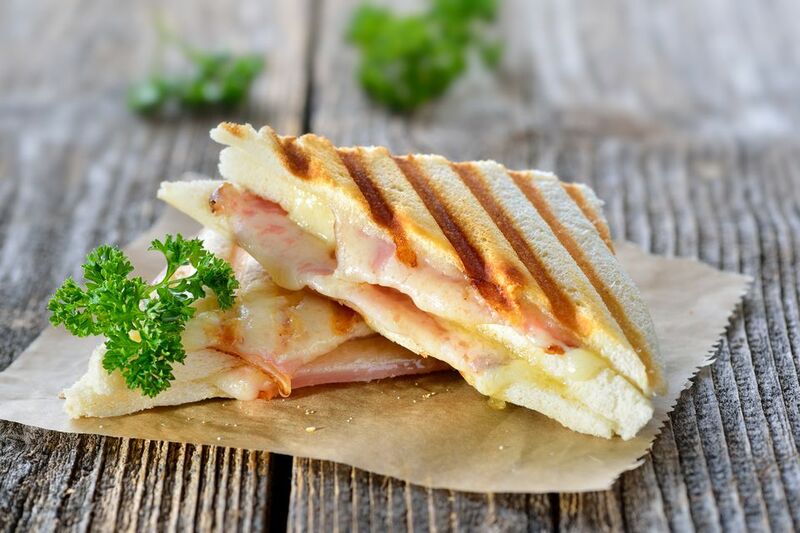 While the temperature is adjustable allowing you to choose just how toasted you want your sandwich, the plates are not removable, which can make it more difficult to clean. This press has a floating hinge that allows it to adjust for foods of different thicknesses, and it opens completely to create a flat surface for grilling. It has adjustable feet so you can tilt the unit to drain grease or adapt to uneven cooking surfaces. It includes two drip cups and a cleaning tool. Imagine having a breakfast sandwich in five minutes at home — perfect for those mornings when you’re craving something hearty but don’t really have a lot of time to make or pick up something at the drive-thru. This sandwich maker lets you make yummy meals out of English muffins, biscuits, small bagels and more. And it’s pretty easy cleanup too, thanks to the fact that you can toss all of the removable parts in the dishwasher. You can get creative with this product, or if you want to be inspired, it comes with recipes. Customers have said that it makes some pretty perfect sandwiches and that it’s easy to use. Some people have warned that the machine comes with a little bit of a learning curve, and that it takes some trial and error to get it down. If you’re willing to play with it a little, you’ll most likely be happy with your product like the majority of those who reviewed it. If you’ve got a small kitchen, it’s a great idea to choose appliances that have multiple functions. This will make both sandwiches and waffles with the removable nonstick plates. It has a light that indicates when the machine is on and when it’s ready. The cord can be tucked away for convenient storage when it’s not in use. The sandwich plates are designed to make a pair of pocket sandwiches, so the filling won’t leak out. The waffle plates can make two square Belgian waffles at a time. The plates are nonstick and are dishwasher safe for easy cleaning. This doesn’t have flat plates, so you can’t use it for panini-style sandwiches. Interested in reading more reviews? Take a look at our selection of the best indoor grills and sandwich presses.